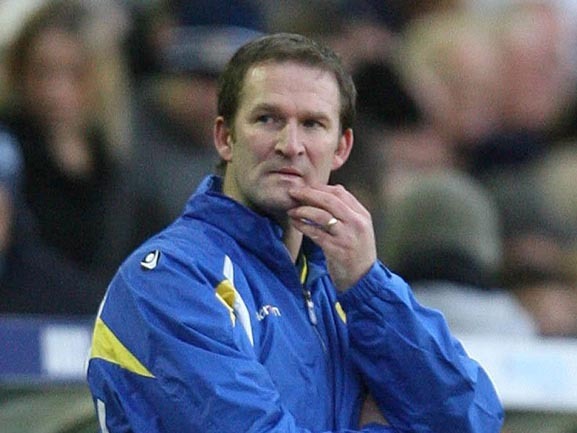 Simon Nicholas Grayson was born 16th December 1969 in Ripon, North Yorkshire and started his football career at Leeds United in June 1988 and progressed through the junior ranks as a right sided defender or midfielder but was unable to make the big breakthrough at Leeds, playing just twice in four years. He signed for Leicester City in March 1992 and went on to make two hundred and twenty-nine appearances in five years. He won a League Cup Winners’ Medal with Leicester in 1997, and was voted the club's player of the season in the same year. Grayson moved to Aston Villa for £1,350,000 in July 1997 and made another forty-nine EPL appearances at Villa Park. He then signed for Blackburn Rovers for £750,000 in July 1999, where he made thirty-four appearances in his first season. He lost his place in the team the following season and spent most of the next two years on loan, with spells at Sheffield Wednesday, in August 2000, playing five games, Stockport County, in January 2001, playing fourteen times, Notts County, in September 2001 scoring once in thirteen games, and Bradford City from February to April 2002, where he got in seven games, all to restrict his games with Rovers, before joining Blackpool permanently in July 2002. Grayson signed for Blackpool on a free transfer on 19th July 2002. He made more than one hundred appearances for the Seasiders and captained the side. He started his career at Blackpool in the right-back berth, but was moved to midfield by former boss Colin Hendry to bolster an area of weakness. Grayson moved into coaching in the 2004–05 season, managing the reserve squad at Bloomfield Road with some success before he was named Caretaker Manager of the first team in November 2005, following the departure of Colin Hendry. After diverting Blackpool away from relegation that season he was given the job on a permanent basis for the start of the 2006–07 season. Grayson retired from playing at the end of the 2005–06 season to focus purely on the managerial side of the game. In late 2006, he led Blackpool to only one defeatin fourteen League games, a sequence that included five wins out of six, resulting in their appearance in the four play-off positions. The run also brought attendances of more than 7,000 to Bloomfield Road. This led to Grayson being awarded the Manager of the Month award for December. On 6th January 2007, he guided Blackpool to the Fourth Round of the FA Cup for the first time in seventeen years, after beating Aldershot Town 4–2 at Bloomfield Road. Theywere knocked out by Norwich City, who beat them 3–2 after extra time, in a replay at Carrow Road on 13th February, narrowly missing out on a trip to London to face Chelsea in the last sixteen. Grayson received his second League One Manager of the Month award of the 2006–07 season in May 2007. Two days later, on 5th May 2007, Grayson guided Blackpool to a final placing of third, and thus a place in the play-offs. Blackpool beat Oldham Athletic 5–2 on aggregate over the two legs of the Play-off Semi-Final. They met Yeovil Town in the Final at the newly-renovated Wembley Stadium on 27th May 2007 and won 2–0, securing promotion to the Championship. It was their tenth consecutive victory, a new club record. This was extended in Blackpool's first game in the CCCL with a League win over Leicester City and a victory against Huddersfield Town in the League Cup. In October 2007, Grayson guided Blackpool to the Fourth Round of the League Cup for the club's first time in thirty-five years. They weredrawn against Tottenham Hotspur at White Hart Lane, where Spurs won 2–0. In December 2007 Grayson signed a two-and-a-half-year contract, following two years working without a formal contract. In May 2008, Blackpool finished nineteenth in the CCCL, their highest finish in the Football League since 1971–72. Grayson was heavily linked with the vacant managerial post at Leeds United, with whom he started his playing career, following the sacking of Gary McAllister in December 2008, but Blackpool refused permission for Leeds to speak to Grayson. Despite this Grayson tendered his resignation, which the Blackpool board did not accept, and he was announced as Leeds United's new Manager. Blackpool were considering taking legal action against both Grayson and his new club. Grayson's first game in charge was at Elland Road on Boxing Day against one of his former clubs, Leicester City, who were top of the League. Leeds had lost their previous five games, but a late equaliser from Robert Snodgrass gave Grayson's new club a 1–1 draw. He recorded his first victory with a 3–1 win away at Stockport County to break a run of six games without a win for Leeds, during which period the team had slipped from second to ninth. After winning five and drawing one of his first eight games in charge, United suffered consecutive away defeats at Huddersfield Town and Hereford United and appeared to be losing touch with the leaders and even a play off place looked in doubt. They put in a good recovery losing only one of their last fifteen League games and finished the season in fourth spot. The play-offs were a disappointment going out to Millwall on aggregate by 1-2. In 2009-10, Leeds and Grayson were off to a flying start, winning nine and drawing one of their first ten fixtures to head the table, before losing 0-1 at home to Liverpool in the Third Round of the League Cup. It was not until their thirteenth League game that they tasted defeat in League when they went down 1-2 at the New Den to Millwall on 24th October 2009. In the F.A. Cup they won 1-0 at Old Trafford and did not go down without a fight which saw them draw 2-2 at White Hart Lane before going down 1-3 to Tottenham Hotspur at Elland Road in a 4th Round Replay. It was not until the 16th January 2010 in their twenty-fifth League game of the season that they lost their second League game. Despite many defeats in the latter part of the season they limped home in second place to finally return to the second tier of English football. After an indifferent start to 2010-11, United finally put an unbeaten nine match run together, which culminated in a 2-0 win at Elland Road over runaway leaders, Queens Park Rangers, on 18th December 2010 to put United in second place on the table. After that inconsistency again set in and they again dropped back into the pack and rarely looked like making the play-offs and finished seventh. Grayson had built a team capable of beating anyone on their day, but inconsistency and a leaky defence was their downfall. The frustration of the supporters escalated as several key players were sold and after some terrible results in 2011-12 it led to his sacking on 1st February 2012, after a 1-4 home defeat by Birmingham City on the night before. There was talk of Huddersfield Town's Manager, Lee Clarke, taking over at Elland Road, but in the end, on 20th February 2012 it was Grayson who replaced Lee Clarke at Huddersfield, after he had resigned five days previously. Promotion favourites Town finally made the play-offs, after finishing fourth, when, despite long unbeaten runs they failed to dominate the League as they had too many draws and not enough victories. In the play-offs they beat MK Dons 3-2 on aggregate before beating Sheffield United 8-7 on penalties after the two teams had played a 0-0 draw after extra-time at Wembley on 26th May 2012. The victory gave them promotion to the Championship. However, things deteriorated and, after Town had failed to win in twelve games and had fallen from sixth to eighteenth place on the ladder, just seven points above the drop zone, he was sacked on 24th January 2013. He and his Assistant Manager, Glyn Snodin, were soon appointed by Preston North End on 18th February 2013. It was a relatively long an happy association, which saw him lead the Lilywhites to one hundred and four wins from two hundred and thirty-five games with just fifty-seven defeats, as he guided them from the lower reaches of League one into a respectable position in the Championship. It lasted until 29th June 2017 when the beleagured EPL side, Sunderland, sought to have him perform the almost impossible task of saving them from relegation from the top flight. Inevitably, after just three wins in eighteen games, he was relieved of his position at the Stadium of Light on 31st October 2017. After Bradford City had sacked long serving Manager Stuart McCall, they appointed Grayson, who had already piloted Blackpool, Huddersfield, Leeds and Preston from League One, to repeated the same feat for the Bantams, 11th February 2018. He halted a run of six defeats but failed to make the play-offs and his reign came to an end on 8th May 2018, when he did not renew his short-term contract.